Bought this book today for my 6 year old daughter! Can’t wait to get it in the mail! Many years ago I styled my daughter’s hair in one puffball on top of her head. Her teacher in Math class couldn’t resist the urge to pat her hair where upon my daughter looked up at him and said “Don’t fluff the puff! !” She was known in class as ‘Fluff the Puff’ from that day on. Can’t wait to read the book!! I brought this book from you guys at the Chicago African festival. It was a pleasure meeting you & I pray for your success sister. Great book! My daughters LOVE this book. My oldest (7 yrs) kept asking to get her hair straightened and curled like the other girls at school. I kept reinforcing that her hair was exactly as it should be. I purchased this book for her for Christmas and she loved it. Now, she says, “A girl shouldn’t go too long without her puff balls” when I do her hair in a different style. Thanks for the wonderful images for our children. It means more than you may even know. Was introduced to this book yesterday at my local library and I just love it. I am the single mother of an 9 year old boy and I decided to read it to him. I know that initially boys won’t be excited about reading stories about girls, but it can be a teaching moment. 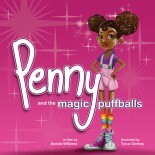 While I was reading, I paused and made a comment about how cute Penny’s hair was. He agreed and he began to tell me about a few girls in his class who have hair like Penny. I wore my hair relaxed for 25 years and I have been completely natural now for about a year. When I try a new style, I am always asking my son how he likes my hair. My reason for doing that and for reading the book to him is because I believe our sons need to appreciate and find our natural natural hair as beautiful as we find it. As a school teacher, I have witnessed first hand how negative criticism young black girls get about their hair from young black boys can be devastating and cuts deeper than criticism from other groups. If we want more black men to find natural hair just as beautiful as they find straight hair, then we have to start teaching our boys now so that they will grow into natural hair appreciating men.